Azamara Quest will win you over in two ways. The first is the down-to-earth friendliness of its passengers and crew. From the fist-bumping officers and chatty shipmates at the bar to the sheer exuberance of the White Party as passengers schmooze and dance for hours on the pool deck, this upscale ship knows how to have fun in a grown-up, non-cheesy way. Service might not be as obsequious as on classic luxury cruise lines, but it's attentive and warm with few glitches because the crew seem to genuinely care. The second is the ship's -- really the entire cruise line's -- focus on destinations. From longer stays and overnights in ports to an emphasis on local foods, unique shore excursions and a lack of sea days, Azamara Club Cruises targets passengers for whom the destination -- not the ship -- is the real focus of their vacation. Quest carries its own touring bikes for cycling tours and hosts a free evening shoreside event, called an AzAmazing Evening, on nearly every cruise, to make sure all passengers get a glimpse into the local culture. Azamara wants you to explore the destination, whether it's on your own or on one of its tours, and is constantly finding new ways to make that happen. As for Quest itself, the 30,277-ton, 690-passenger ship is intimate and easy to get around. Most of the public spaces are found on Deck 5 (theater, bars, shops, main dining room) and the upper decks (pool, specialty dining, library, observation lounge, spa). You won't be overwhelmed by places to dine or hang out, but there's enough choice given how little you might find yourself onboard. With hundreds -- rather than thousands -- of passengers onboard, you'll rarely experience crowding or queuing. Food onboard is wonderful, with diverse menus that can accommodate a range of tastes and special needs and have some international flair. The Windows Cafe buffet venue is one of the best at sea, with themed dinners, stations for local foods, a smoothie bar, daily sushi and a changing selection of multiple flavors of gelato. The steakhouse and Italian venues are worth the extra charge, and the ship also puts on unique dinner events, such as an Indonesian rice table, chocolate buffet or sea-day dim sum. You're not going to find a ton of caviar and foie gras, but you will feel pleased and sated after meals. However, Azamara Quest is old -- it debuted in 2000 -- and that means some aspects of the ship, namely accommodations, are not up to modern standards. Regular (non-suite) cabins are tiny. Most people don't spend much time in them (unless they've booked a suite, which are more livable sizes), so size is not a big problem, but can be a shock at first. A 2016 refurb modernized the decor and added extra outlets and USB ports, but storage space is still tight. And the bathrooms might be the smallest you've ever experienced (including on the big ships), and the showers are so tight you don't have to be very tall or very wide before they're uncomfortable. It's the biggest obstacle to booking a cruise on this ship because you're paying a lot of money for this experience. And sometimes, equivalent itineraries on more inclusive lines can be a similar price. Another quirk about Azamara is that its fares are semi-inclusive, meaning more items are included than on mainstream lines, but fewer than on true luxury lines. This can be a bonus or drawback, depending on your perspective. Gratuities, fitness classes, self-serve laundry, shuttle buses and some drinks (a short list of house wine and beer, select liquors and cocktails, most nonalcoholic beverages) are all covered by the cruise fare. It's a relief not to be constantly nickel and dimed. Yet some passengers might grumble about paying extra for specialty restaurants (suite passengers get these comped) and having to navigate the confusing bar menu to figure out which cocktails are included and which are not. Ultimately, Azamara Quest is a ship that transcends its hardware limitations with friendly crew, great food, modern decor and a sociable onboard vibe. The cruise line's destination focus gives travelers plenty of choice in how they want to experience their vacation -- spend all day and many evenings in port and use the ship as merely a place to sleep and eat, or split time between exploring ashore and enjoying the intimate ship's public areas. It's a ship geared for grown-ups on a quest for destination immersion and onboard entertainment that's fun but not cheesy. 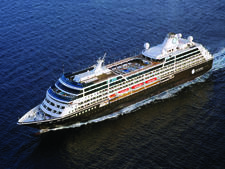 On both counts, Azamara Quest delivers. Passengers are well off, well-traveled and interested in exploring the ports (whether that be touring, shopping, beaching or eating). We also found the ship to be extremely friendly, with passengers striking up conversations everywhere. It makes for a convivial atmosphere onboard. Azamara Quest's evening dress code is always resort casual, which makes packing easy. Men wear slacks and nice, collared shirts; women don dresses or cute tops with dressy slacks, capris or skirts. Mainly passengers dressed nicely but not necessarily fancily. Distressed or torn jeans, tank tops, shorts, swimming attire and baseball caps are not permitted in the main dining room or specialty restaurants. At Windows Cafe, the pool deck buffet, passengers must wear footwear and a cover-up or shirt over their swimwear. Daywear is casual, with passenger dress running the spectrum from shorts and T-shirts to sundresses and stylish resortwear. 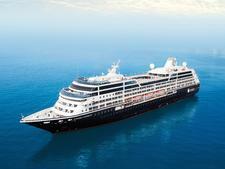 Azamara is a semi-inclusive cruise line. Fares cover gratuities, self-service laundry, shuttle service (when the downtown is a hike from the port), basic fitness classes like yoga and Pilates, and an AzAmazing Evening shore excursion on most itineraries. Some drinks are included: bottled water, soda, coffee (including specialty drinks like cappuccinos or lattes), tea and select beer, wine and liquor. However, the included liquor list is much smaller than you'd find on a true all-inclusive cruise line, and figuring out which drinks are free and which aren't can be tricky. The main things not included are specialty dining (unless you're in a suite), shore excursions and spa treatments. Tips are automatically added onto the price of your spa treatment; they are not added or expected for extra-fee drinks. Tipping is also not expected in the specialty restaurants, but there is a line for a gratuity on the chit you have to sign, which is confusing. The onboard currency is the U.S. dollar.